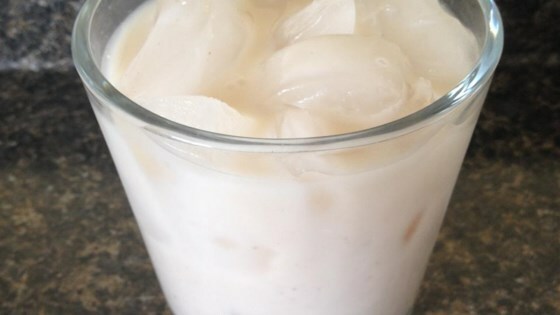 "A creamy ice cold horchata that is simple to make. Serve chilled over ice." Blend 2 cups skim milk, rice, and cinnamon sticks in a blender on low speed until rice and cinnamon are slightly chopped. Increase speed to high and blend until rice is very small and cinnamon sticks are crushed, 2 to 3 minutes. Pour rice mixture into a sealable container and cover tightly. Refrigerate for 24 hours. Strain rice mixture through a fine sieve into a bowl. Discard rice and cinnamon sticks. Stir remaining 6 1/2 cups milk, coconut milk, sugar, and vanilla extract into rice mixture until sugar is dissolved. Refrigerate until chilled.